Being lucky enough to have a large site the club constructed a twin gauge ground level track for the operation of passenger hauling trains. Track is constructed of three rails giving both 2.5″ and 5″ gauge. 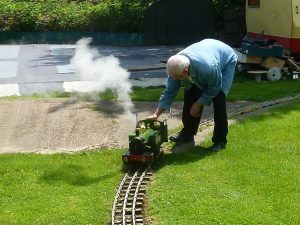 Most activity relates to the 5″ gauge but those interested in or potential users of either will be warmly welcomed by Cliff Daniels the section’s leader. Starting from the far end of the site there is a turntable from which the track runs behind the G Gauge and 0 Gauge layouts before turning in front of the clubhouse where it forms a loop, with a short siding. We have both battery and internal combustion engines in use to haul passengers on open days. Plus we have a small fleet of live steam locos, recently acquired, which are in the process of being overhauled and fully inspected prior to the necessary bolier certificates and insurance. Once that is complete, and we’ve sufficient trained operators it is hoped to use steam at future open days. During 2018 points were re-radiused for better running and proper facilities for live steam are being planned for 2019. Further plans include the construction of a locoshed and servicing workshop, but that’s still in the early discussion stages. 1) Catriona: The first of the locos being brought back into order. 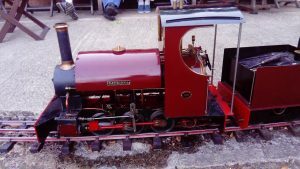 She is an 0-6-0 tender loco constructed in a narrow gauge outline by Blackgate Engineering, from the “Sweet Pea” design, finished in a maroon livery. 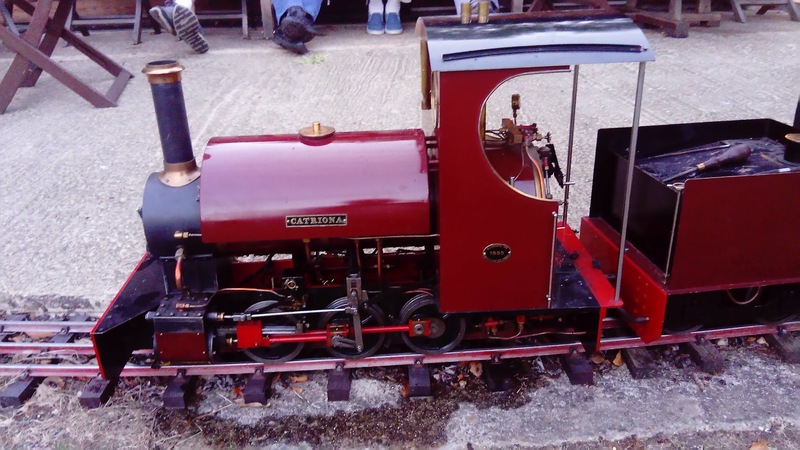 She has a marine boiler, with two water tanks, one as a saddle tank the other in the tender, and is capable of hauling trains carrying about ten adults. 2) This loco is a little Green 0-6-0 tank loco. She’s had a successful steam but requires some TLC before seeking her boiler certificate.